We’d love your help. Let us know what’s wrong with this preview of Even Honey Expires by Carlene Love. Sin Pointe drummer Will Cordero has good reason to keep his marriage a secret. In an age of no privacy, there’s too much danger and drama should he introduce Honey to the Sin Pointe masses and he’ll do whatever he can to protect her from that. Besides, it’s been pretty perfect having her all to himself. Until one day when he discovers a note she’s written that he was never Sin Pointe drummer Will Cordero has good reason to keep his marriage a secret. 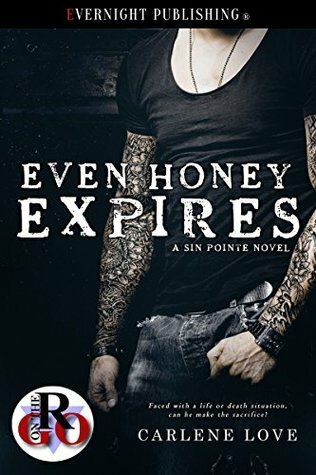 In an age of no privacy, there’s too much danger and drama should he introduce Honey to the Sin Pointe masses and he’ll do whatever he can to protect her from that. Besides, it’s been pretty perfect having her all to himself. Until one day when he discovers a note she’s written that he was never meant to see. To ask other readers questions about Even Honey Expires, please sign up. Carlene Love has a way of enveloping a reader in just a few sentences and not letting go until the last word. Even Honey Expires is a beautifully written short story proving love can span the test of space, time, and even life. It's the perfect one sitting read and a great accompaniment to the Sin Pointe series but also works as a stand-alone story. This book melts my heart. It leaves you wanting more.....it seems the author has another book in the works. Yay! I look forward to reading more of Will's story.